Cayuga County and the Finger Lakes offer a variety of options to make your Finger Lakes wedding or special event extraordinary. With our eight lakes, we are one of the most picturesque locations in the Finger Lakes region to celebrate a destination wedding, commitment ceremony, reunion, landmark birthday, anniversary or any other special occasion. 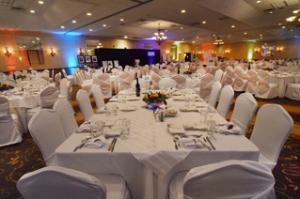 We offer the perfect setting for a variety of social gatherings and celebrations. Imagine your wedding ceremony with the sunset over Cayuga Lake as the backdrop or a chapel decorated with stained glass and mosaics completely designed by Louis Comfort Tiffany. You’ll find them here in Cayuga County! When you see the breath-taking beauty of our Finger Lakes, you will know why so many brides and grooms choose the Finger Lakes as the place to begin their lives together. Whether you are looking for a small and intimate venue or a place to host hundreds of friends and family, we are here to help you find a location that will make your wedding unforgettable! From lovely Finger Lakes wineries to historic inns to contemporary ballrooms, you’ll find ideal settings that will make any celebration unique, personal and memorable. Cayuga County is the ideal location in the center of the Finger Lakes and New York State to gather for bridal and baby showers, anniversaries, family reunions, birthday parties, engagement parties, bachelor/bachelorette getaways and graduation parties. The best part about choosing Cayuga County and the Finger Lakes is that there is so much for your guests to do while they are here. Golfers, wine connoisseurs, outdoor enthusiasts and culture-vultures will all find more than enough to keep them busy! Our web site will help you find that perfect venue and locate services you may need from bakeries to caterers to florists and much more. In addition, our friendly staff is always happy to assist you with recommendations suited to your unique needs and supply you with brochures and maps for your guests. Please call us at 800-499-9615 and let us know how we can help you.